Every woman swears by mehendi, if you have to look ethnic for an important ritual then without mehendi the look will be absolutely incomplete. 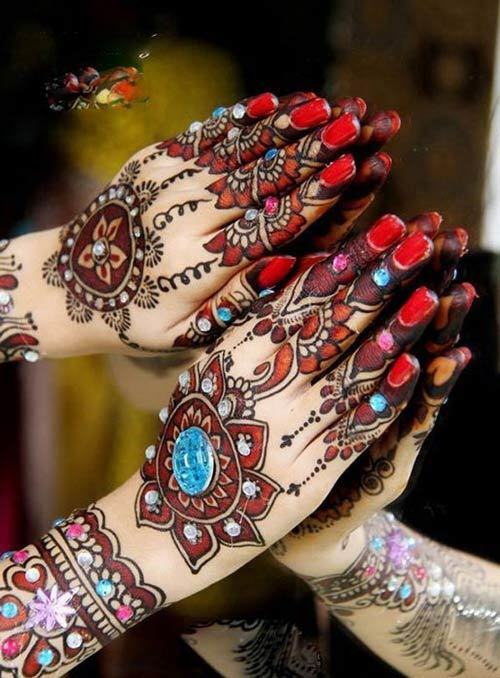 Mehendi is not just loved for its beauty; it is an important part of the whole ritual and is believed to bring fortune.Mehendi is derived from the Sanskrit word Mendhika, the use of turmeric and henna paste is supported by Hindu ritual texts and history. 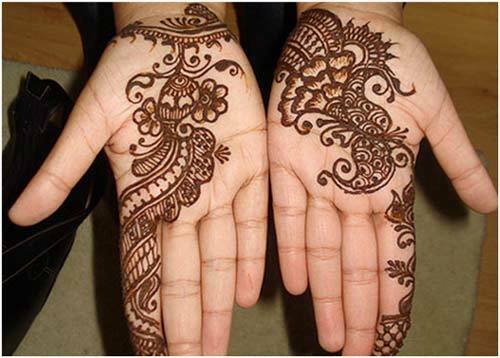 Mehendi or Henna used in India is derived from mehendi plant which is scientifically known as Lawsonia Inermis and is popularly called the henna tree. This flowering plant is native to Arabian Peninsula, North Africa, Near East and South Africa. 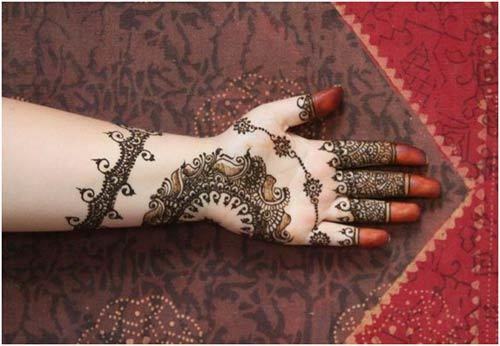 Mehendi custom is celebrated with pomp in many Arabian countries. 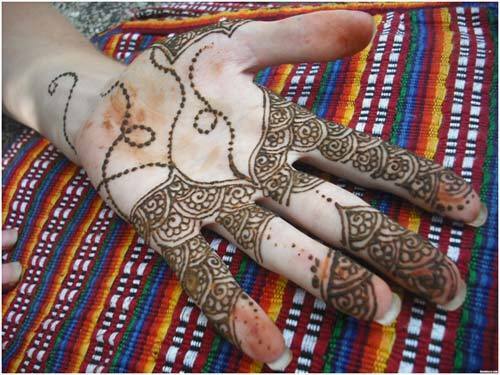 History proves that mehendi or Henna was used in Europe in 19th century.This Arabic culturehas become an integral part of Indian custom. Mehendi has become an important ritual in all communities in India and is usually followed by other fun filled programs like DJ nights. Henna is the paste that is made from the stems and leaves of the henna plant and when it is applied on the hand it become mehendi. The leaves and stems are dried and grounded into powder. To make the henna paste you have to first sift the henna powder using a nylon strainer. This will help to remove chunks that can clog the mouth of the applicator. Then pour the henna powder in a bowl, add quarter cup or 60ml of lemon juice and whisk it into a thick consistency.Then add sugar and essential oil (Lavender oil, tea tree, Cajuput or Raven Sara oil) and whisk it really well till the texture becomes silky smooth. Cover the bowl with a cling wrap and keep it in room temperature till the dye separates and comes to the surface.Add more lemon juice to the dye that separates and comes to the surface till you get yogurt like consistency. Pour the paste into a plastic cone and twist the top of the cone twice and secure it tightly with a rubber band. Apply gentle pressure with your thumb on the top of the cone to dispense the mehendi. If this doesn’t work then you have to clip the tip of the cone to enlarge the opening, but be careful not to make a big cut since this will spoil the design. Always wash your hands with soap and water before you apply henna. You can also use alcohol based lotion if your skin is oily, and to get the dark colour on your handsyou can apply mehendi oil as well. 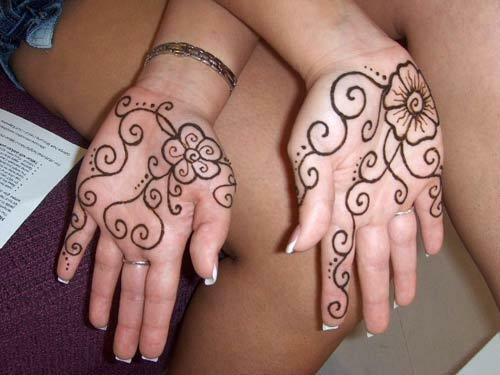 The U.S. Food and Drug Administration (FDA) don’t recommend henna to be used directly on the skin. There are reports of contact dermatitis, an allergy caused by the pigment present in the dye. Discolouration of the skin or Hypopigmentation has also been reported. So in United States it is used as a hair dye. If you had allergic reaction to henna avoid it totally. You can also do a patch test before applying it on your skin. Try to your tattoo on your upper arm where you can cover it with sleeves, if you don’t want to reveal the tattoo that has faded. Let it wear off naturally, don’t rub or pick at it. Take some protection before you apply mehendi, especially sticker mehendis that are available these days. If you are using glitters and stones make sure the adhesive that is used is skin friendly. If you get any rash or allergy visit the doctor immediately. Consumers and dermatologists state that harmful chemicals like para-phenylenediamine (PPD) are present in the mehendi cones. Do you know the same chemical is used in ink cartridges for the printing and photocopying machines? PPD is toxic and can cause body pain, restlessness and itching. Always make the henna paste at home. I know the readymade cones give you the desirable red and black colour, but why take the risk? Usually in India, the traditional mehendi is used but nowadays, you can also find red mehendi as well as black mehendi being used. 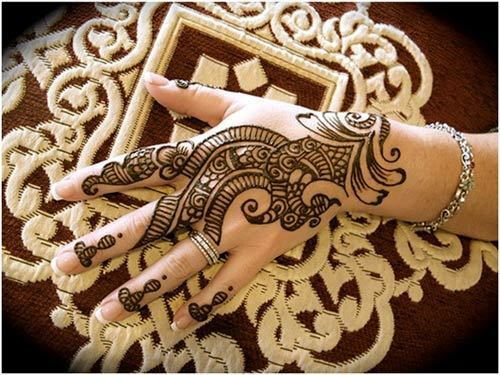 Black mehendi is very popular in Arabic mehendi designs for hands or feet and now is being used to draw borders of the designs to make them prominent. 1. 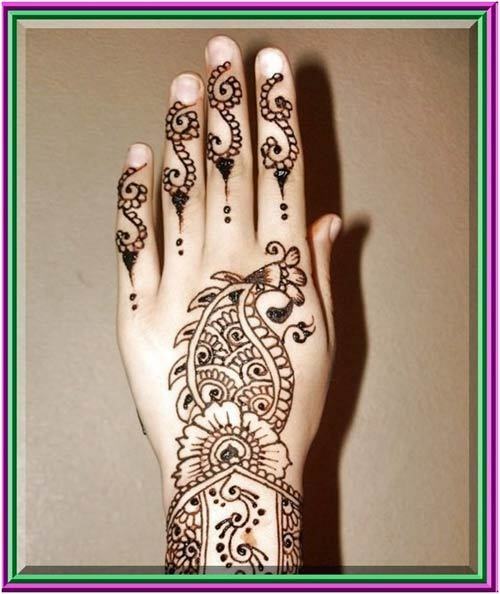 The first mehendi design is apt for Eid and similar occasions where women love applying henna on their hands. Eid brings happiness to all Muslim homes across the globe; it not only calls for a gala feast, the ladies of the house organize mehendi sessions. Each one applies mehendi on other person’s hand and makes the whole festival so colourful. Some even call professionals to create those intricate mehendi designs. 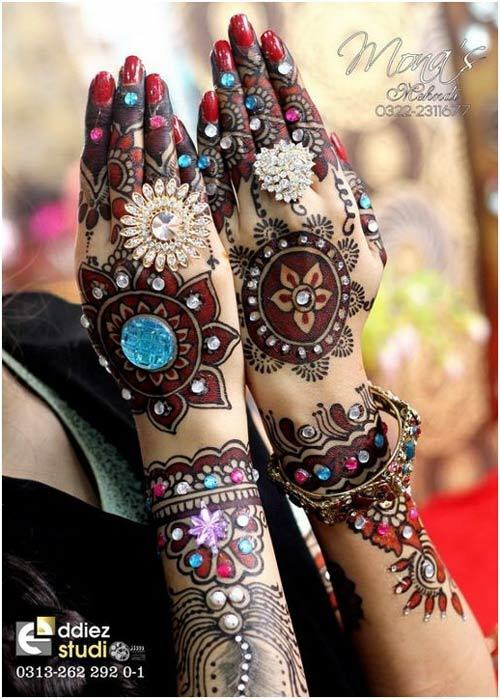 Pakistani mehendi designs and Arabic designs are best for Eid.The above design looks pretty on hands and is not too messy or intricate. It can easily pass off at work without any problem. Use Black Mehendi for the best effect. 2. How about some unique designs to relieve you from those boring traditional mehendi patterns? Here’s one we love and though it has traditional motifs, the whole design looks very modern. 3. 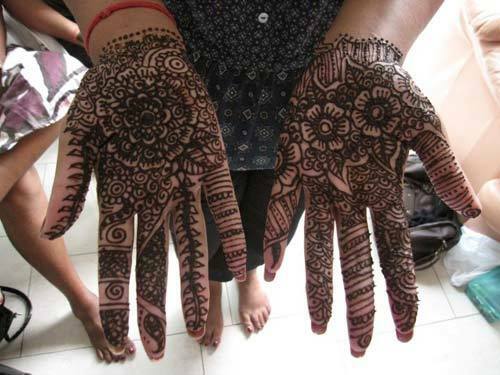 Here’s another mehendi design for those who want a more filled up look on the hands. The hands are filled with intricate designs and patterns. The flowers and butterfly patterns also make this a great choice for bridal mehendi. Did you know that unless your would-be-mother –in-law didn’t apply the mehendi on your hands the mehendi ceremony will not start? Yes this is prevalent custom in some cultures and adds more fun to the whole occasion. Some even tease the bride saying if the mehendi colour becomes really dark then you will have a doting husband, girls really love hearing this over and over again. We don’t know whether these beliefs are based on truth or is just said for fun, but surely no one will ask you to run errands for at least some hours, you can relax for a while. 4. Here’s how you can be traditional and modern at the same time. This design shows how beautiful patterns can be included on the back of your hands too. The weave patterns and floral patterns make this style traditional yet modern and very apt for weddings. 5. 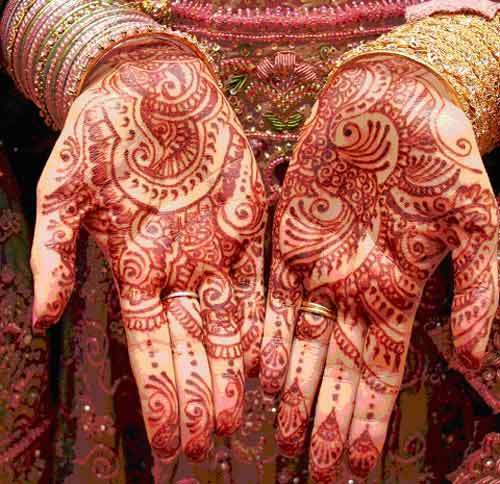 Weddings are incomplete without beautiful mehendi clad hands of the bride. 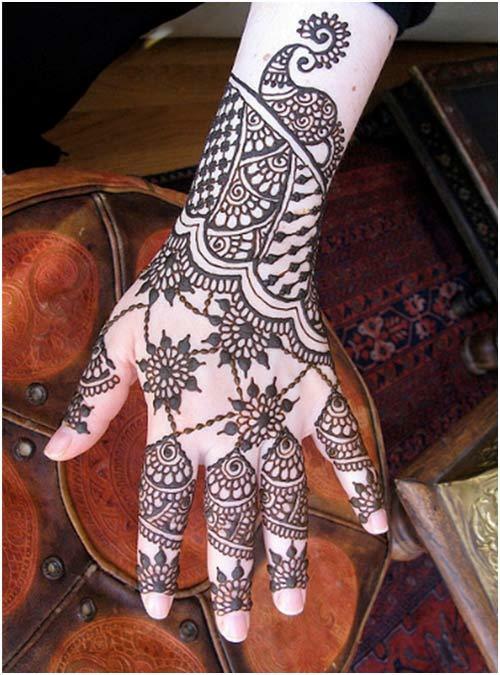 If you love traditional motifs and patterns on the hands, then try this style. Red mehendi makes the design look really beautiful and the red colour makes the mehendi even more prominent. The fingers and palms are filled with designs but they don’t look messy at all. 6. 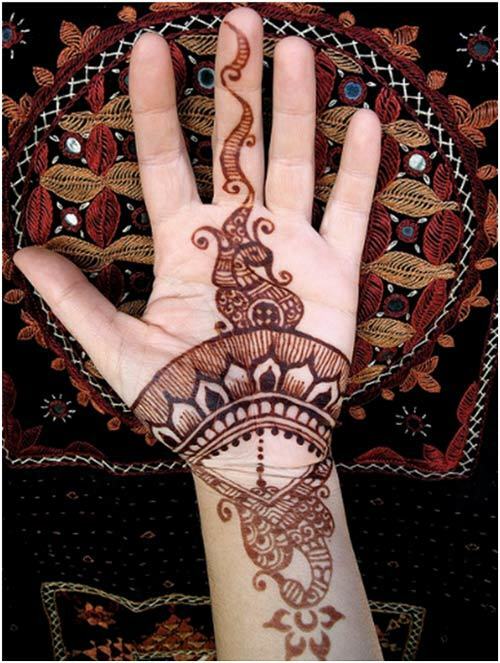 Love mehendi designs for hands but don’t want your hands to be filled completely with the design? Don’t worry this style is just for you. You can get it creating a small design that uses very little of the mehendi, keep the hand really simple by focusing on just one motif. This is very apt for those who have too many obligations at work to wear heavy mehendi. 7. This one is for those who want a simple yet traditional mehendi designs for hands!This mehendi design for hands is very easy to do and one can do it themselves. This is great for any occasion and age. 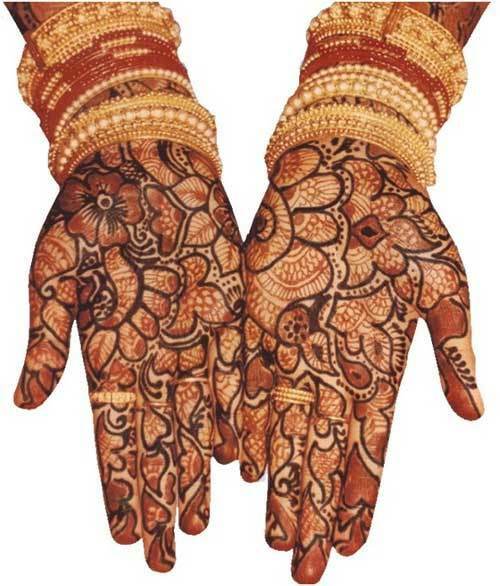 The use of very less mehendi makes it very apt for those who desire minimum patterns and motifs on their hands. 8. How about getting mehendi done on Karva Chauth? If you are not aware of Karva Chauth, it is a one day festival celebrated by married woman of North India and Gujarat. After a whole day of fasting, the women look at the Moonthrough the sieve and then look at their husbands. They pray for the long life for their husband and also ask for divine blessings for their wellbeing. This festival is popularized by films and is given a romantic connotation. Mehendi is done a day before Karva Chauth. Women literally compete with each other and flaunt their designs, it is a great way to bond with friends and family. 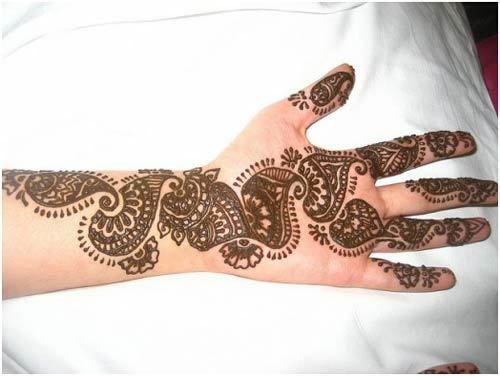 Here’s one design we loved, it has beautiful and intricate d motifs all over the hand. The gaps in between the designs add to its beauty. These full hand designs will also suite brides and occasions of weddings. 9. 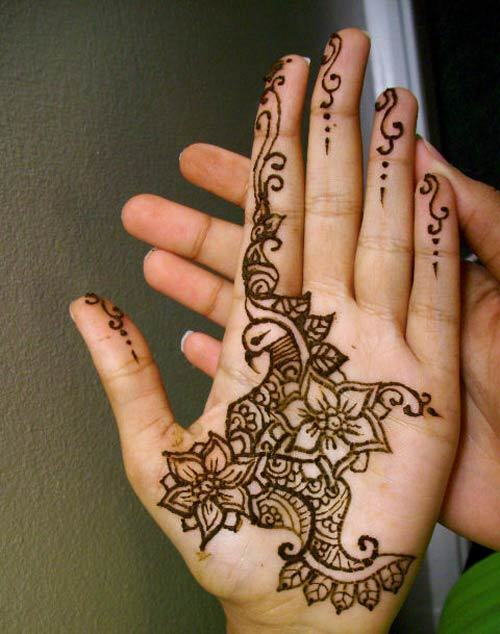 A simple yet beautiful design for those who want the mehendi to be minimal yet beautiful. The design is perfect for Eid and small functions. 10. This is a very simple yet feminine design which will look great on any occasion as well as on the hands of the bride. 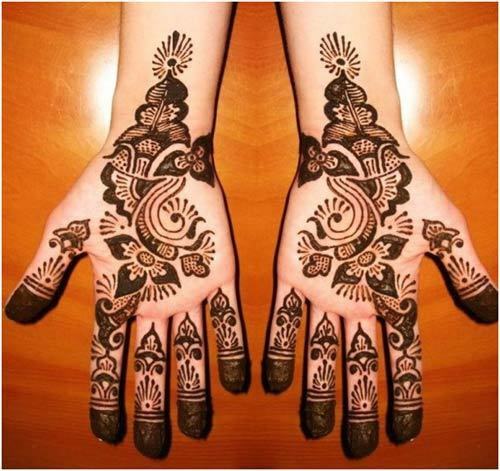 The use of Black mehendi design for hands here makes the design more prominent and beautiful. 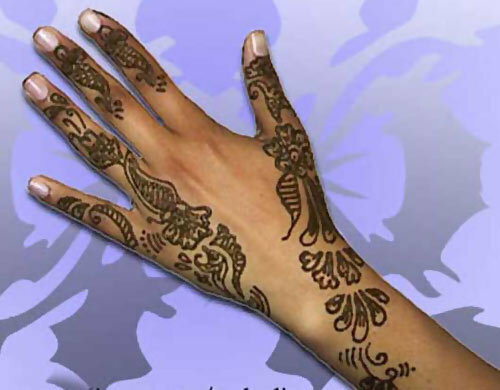 It makes it bold and is generally used in creating simple Arabic Mehendi designs. 11. 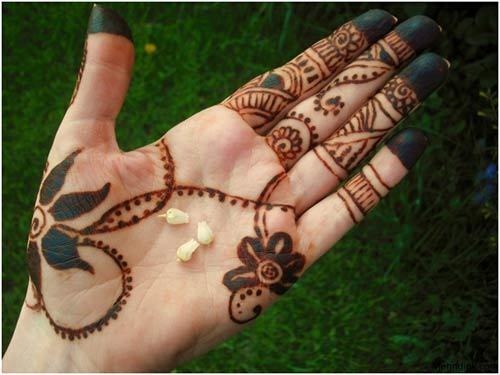 Here is another cute design, where very little mehendi is applied on the back of your hands. There are not much intricate designs or shading. Simple yet beautiful designs like this suit all occasions like Eid, weddings and other occasions like your friend’s birthday party, engagement or marriage registration. You can wear them to college as well. 12. 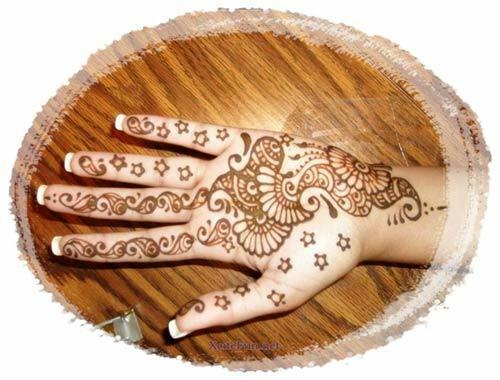 Looking for simple mehendi designs for hands This design may look very simple but it covers the hands with beautiful motifs where required and fills in all the gaps. The diagonal design makes hands look beautiful and can be done on any occasion. This particular design will look good on children too, on whose tiny hands, large designs just don’t sit well. 13. From some simple modern patterns, we move onto a full hand mehendi design for the wedding occasion. This extravagant design and motif will make anyone go ‘wow’. The intricate designs are traditional and are very microscopic and the pattern on the fingers is quite unusual. The whole patterns used have a modern touch to them. 14. 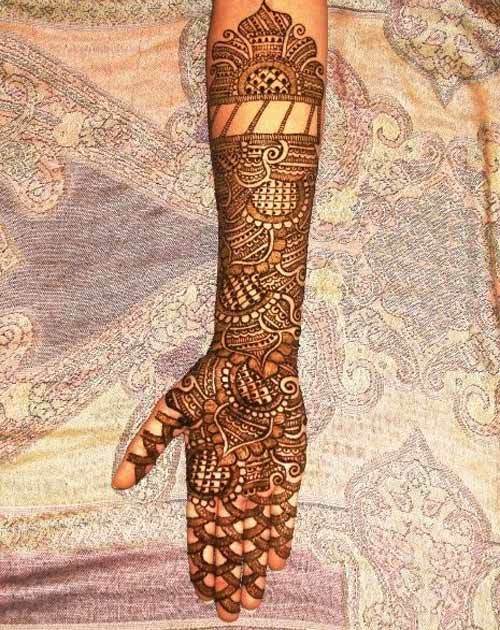 This pattern again is suitable for brides who want simple yet beautiful mehendi designs. This design is devoid of the messy look. Today’s women don’t like intricate designs but those which are simple and elegant. Many have to join office post marriage so they wear designs that will not raise eyebrows. Brides decorate both their hands and feet for their wedding, since it is their day to look the best. Since, all eyes are on her.The patterns are quite modern and the gaps between them make this a classy choice for the modern bride. 15. This is apt for occasions like Karva Chauth and engagement parties. On the day of engagement, the whole attention will be on your hands so this pattern will be apt for the day. 16. 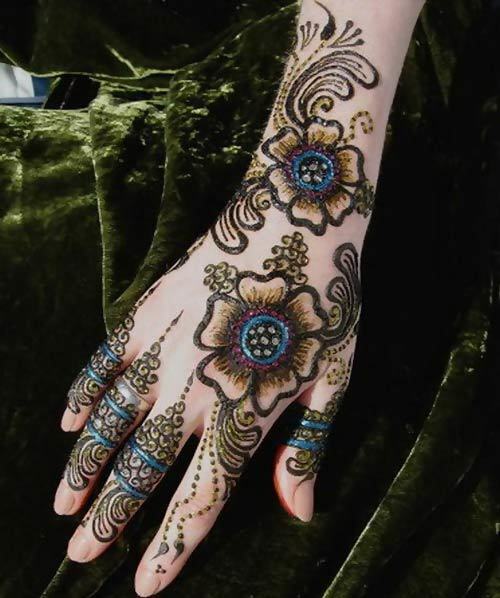 Want some Arabic mehendi designs for full hands? Then try this modern Arabic design with very less patterns and is very easy to do yourself. 18. 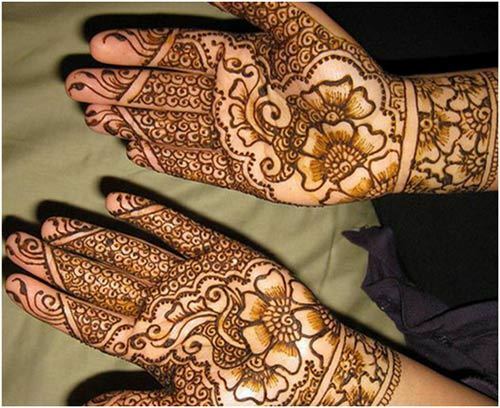 Here the use of black mehendi on the palm makes the designs more prominent. The different patterns on the fingers make this design unique. 19. This is also very apt for the bride. The design is created using traditional motifs which makes it look elegant. The whole palm as well as the back of the hands is filled with beautiful motifs. 20. 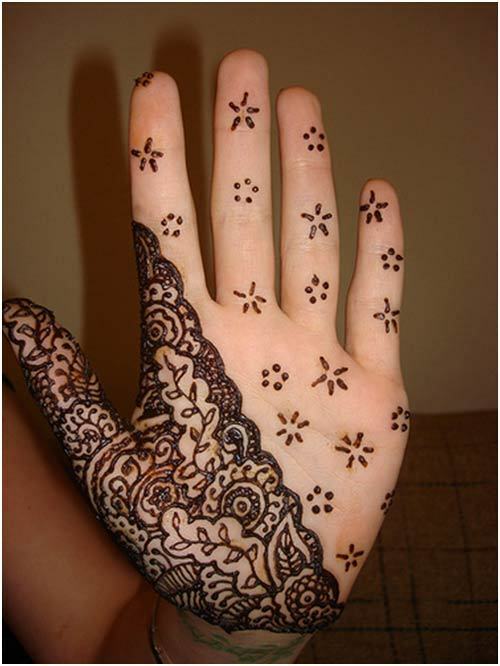 Here is a very simple yet chic bridal mehendi design for full hands. The design is for those ladies who do not want fussy designs. It is ideal for Eid and other occasions. 21. Here’s a simple but gorgeous design. The large pattern on the middle of the palm as well as the designs on the fingers and wrist makes this design unique. This design is fit for any occasion and for those who want traditional yet unique designs. 22. 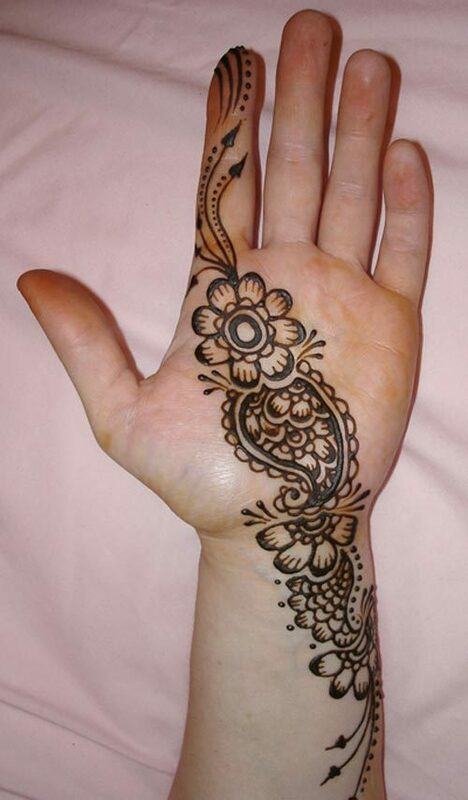 Here’s a mehendi design with shading and traditional patterns. The design is not tough but none the less it looks great on any social function. 24. 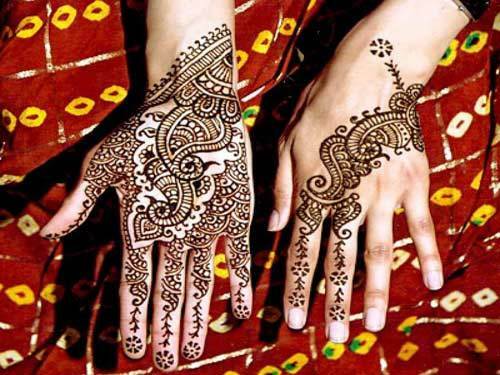 Love modern designs or are you just venturing into mehendi? Anyone can choose this unique design with the lotus as the central idea. The uniqueness as well as the simplicity renders this design its specialty. If you are just new to the concept or want some unique simple design on the back of the hands, try this one. 25. Here’s another very simple design inspired from the Arabic mehendi trends. 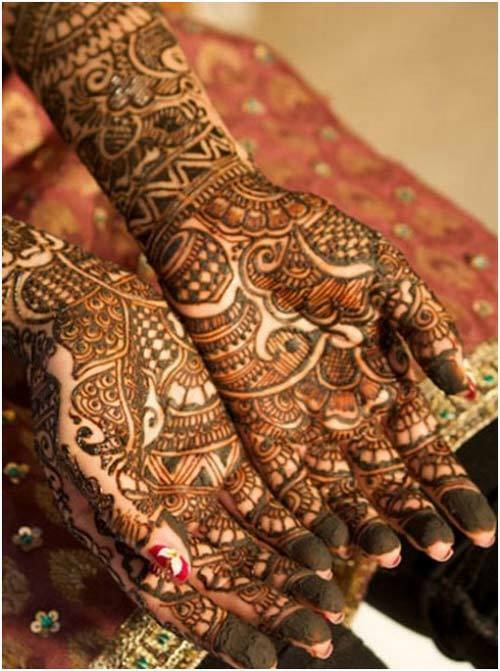 The use of black mehendi makes the design prominent and beautiful. This simple design can be carried off by anyone and can be used on any occasion. If you are in need of a less messy and simple mehendi design, this will be your favorite choice. 26. Here is a simple yet very traditional design for the hands. 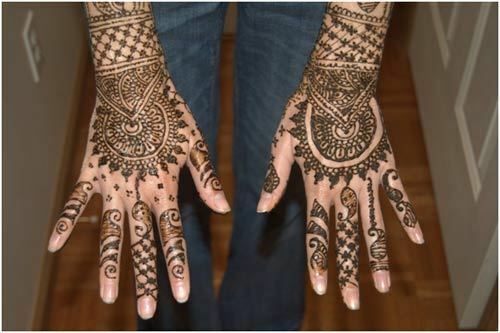 It consists of traditional Indian mehendi designs and can be used by anyone. 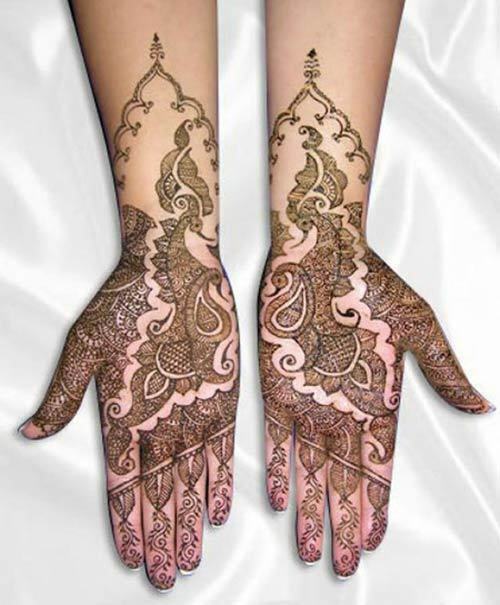 The design contains less complex motifs which makes this a good and simple bridal mehendi design. 27. Bored of the same old colours on your mehendi? Then here’s a way to add some colour to your hands with this Glitter mehendi design. The designs are drawn using normal mehendi and the motifs and patterns are filled using Glitter from the tube. 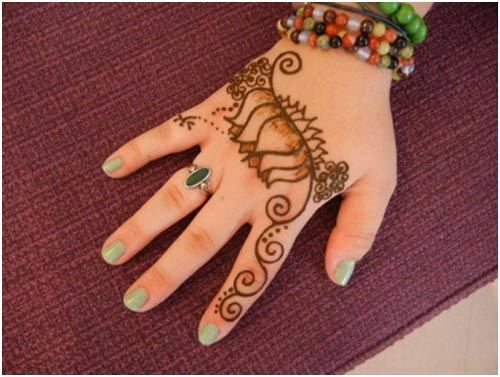 This is a new way of using mehendi and is very popular for parties and casual occasions. 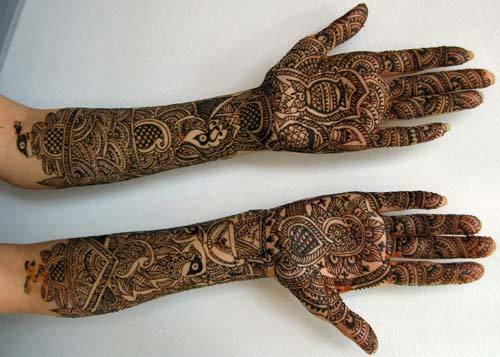 Even the modern bride may try this type of mehendi design. 28. A very beautiful design using weave patternsor jali work and lace patterns on the hands. These patterns look great for marriage occasions. This mehendi is very apt for the bride on the wedding as well as on the occasion of engagement. The design is simple yet very feminine and beautiful. 29. These designs like some of the previous ones can be done by you. The designs have a touch of modernity making it a nice choice if you are bored of sporting the same old patterns. 30. 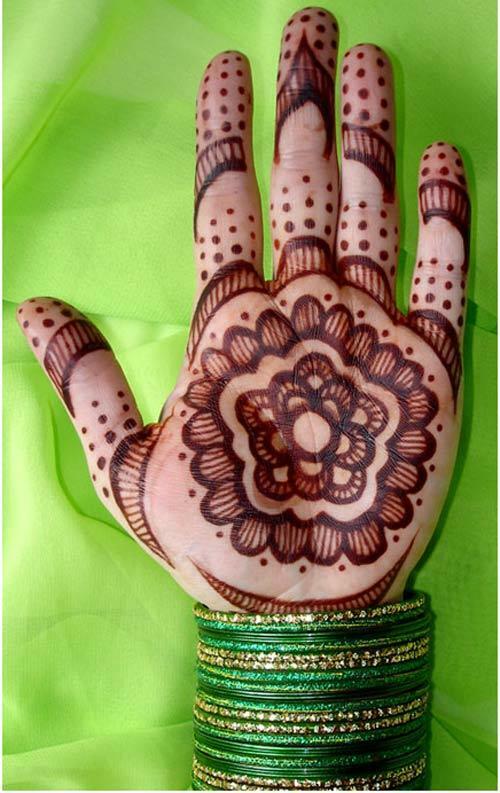 Here’s another simple design for those who want simple mehendi designs for their hands. These designs make the hand look less messy and the simple design naturally enhances the beauty of your hands. This design is modern with a traditional touch making it a good choice for the bride. 31. If you want to have a truly colorful mehendi design, try this style with multi coloured glitters and minimal designs. The different colors surely bring out this design and make this apt for the modern age. These can be worn on any occasion and will not look boring or old fashioned. The patterns are also quite unique and modern. A total hit for youngsters. 32. You can see the use of both red and black mehendi in this design. The fingers are done with red mehendi while the rest of the patterns are done with black mehendi. The design is kept minimal and open portions of the hands add to the design’s beauty. 33. Do you love doing mehendi yourself? Then try this super easy pattern which is ideal for Eid or any other small occasions. The patterns are kept minimal and simple. The tips are filled in and curved lines as well as floral and geometric patterns are used.You can practice using the mehendi cone and soon you will be able to create designs like a pro.Start with simple design and as you progress try those intricate ones. 34. Here’s a modern and simple design for anyone looking for a beautiful and simple design for their hands. This pattern includes floral patterns and curved lines. The tips of the fingers are kept open.This design can be done for any occasion or it can be just done for fun. 35. Here’s another glitter mehendi design with added beads. The design is kept simple and the inclusion of multi colored beads gives this a modern feel. It is very apt for parties and for the modern bride. The stones used are of different sizes and colours and the glitters also differ in colour.This design is loved by those who like vibrant colours, they add more hues to their original mehendi design. 36. 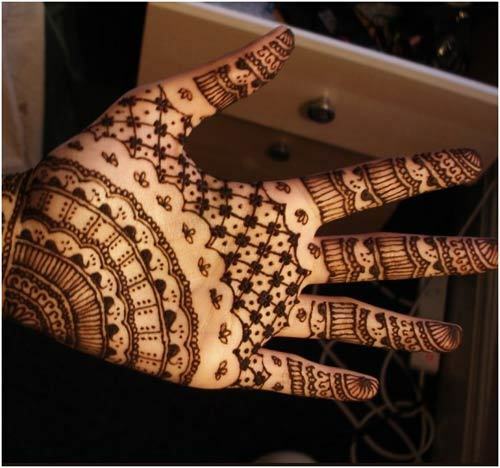 The last one we want to present is a modern day Indian mehendi design for the back of the hand. 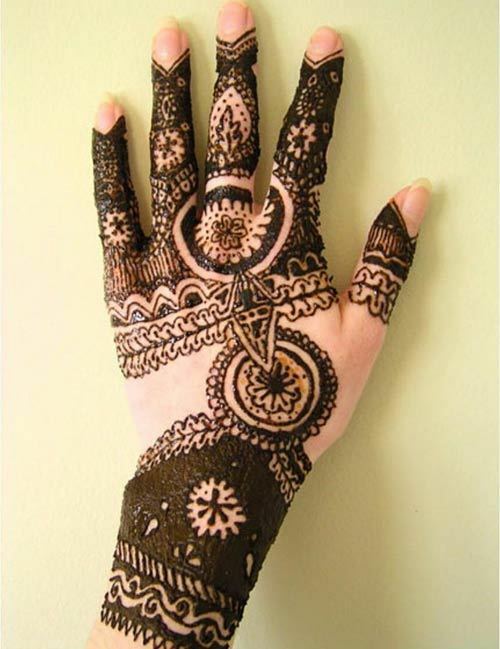 The use of black mehendi makes the design more prominent. Also this design involves very little congestion of designs and patterns. The patterns are unique, especially the pattern on the fingers are quite unique. The design will suit anyone and will also be apt for the brides. 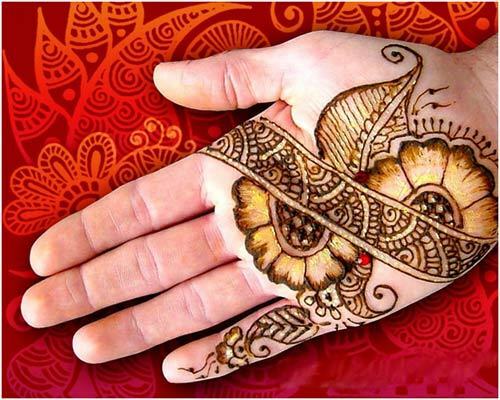 Mehendi is the integral part of the Indian culture, an ethnic look remains incomplete without a mehendi. Nowadays many youngsters do a single mehendi tattoo using red and black mehendi. Many are afraid of the procedure involved to do a permanent tattoo, which is also a taboo in our country. Most of the times you have to hide a tattoo rather than flaunt it, with mehendi tattoos you don’t have to worry about all this. You can wear it anytime and do it yourself, so just go and have fun creating these simple mehendi designs on your hands and that of your friends. Keep in mind, that simple is elegant. Stay stylish always!